Deploy the CData JDBC Driver on JasperReports Server to provide real-time Dynamics 365 Sales data access from reports, embedded analytics, and more. The CData JDBC Driver for Dynamics 365 Sales enables you to provide access to Dynamics 365 Sales data across the enterprise. This article shows how to deploy the driver on JasperReports server and create a simple report based on a reporting domain, a business view of Dynamics 365 Sales data. Follow the steps below to deploy the driver JAR on JasperReports Server. The instructions below contain specifics for Dynamics 365 Sales and the Tomcat server bundled with JasperReports Server. If you are using JBoss AS 7 instead of Tomcat, you can follow the standard process to deploy the Dynamics 365 Sales JDBC Driver on JBoss. Copy the driver JAR and .lic file, located in the lib subfolder of the installation directory, to the lib subfolder of the apache-tomcat folder, located in the JasperReports Server installation directory. Specify the required connection properties in the JDBC URL — the url attribute. Dynamics 365 uses the OAuth authentication standard. See the Getting Started section in the help documentation for a guide to completing the process. 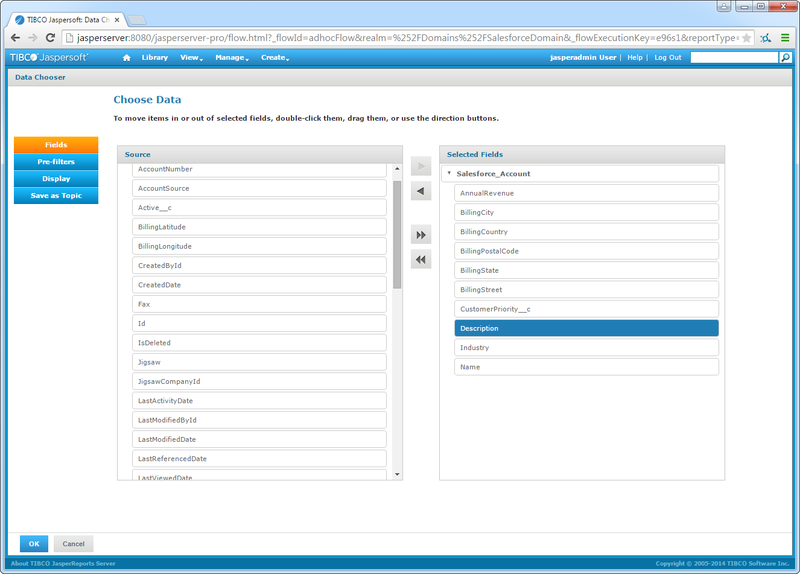 Log into JasperReports Server and click Create -> Data Source. In the Type menu, select JNDI Data Source. In the Service Name box, enter the JDNI lookup defined in the resource definition in the web.xml file. In the example, the lookup is "jdbc/d365sales". A domain is a metadata and access-control layer that surfaces a relevant business view to report creators. Follow the steps below to select Dynamics 365 Sales columns, apply filters, and execute SQL to create a domain. Click Create -> Domain. Enter an Id for the domain and select a save location. Click Browse in the Data Source section and select the Dynamics 365 Sales data source you created. In the Domain Design section, click Create with Domain Designer. Select the schema containing your tables. On the Tables tab, select a table in the Data Source pane, and then click the arrow to add them to the Selected Tables pane. On the Joins tab, you can join tables by selecting the columns you want to build the join condition and selecting the join type. On the Pre-Filters tab, drag and drop columns to define search criteria that filters the data exposed through the domain. On the Display tab, select Dynamics 365 Sales data into the data sets presented to the user. Click OK to accept your changes and click Submit to create the domain. After you have created a domain, you are ready to connect to data. 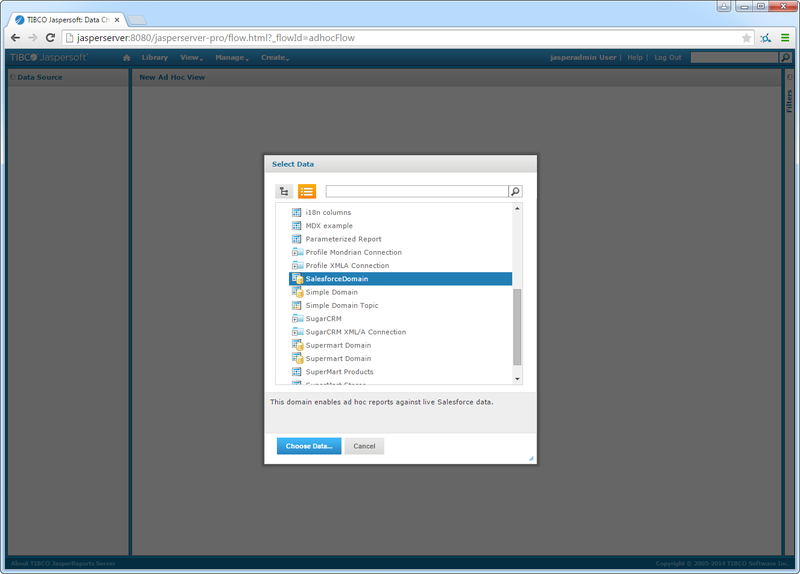 Follow the steps below to create an Ad Hoc View in the Ad Hoc Editor. Click Create -> Ad Hoc View. In the resulting dialog, select the Dynamics 365 Sales domain you created. On the Choose Data page, select columns that you want to use in the view. In the Pre-Filters section, you can create filters based on the selected fields. In the Display section, you can modify column information as presented by the domain. After completing the wizard, select the view type and add columns to the view. 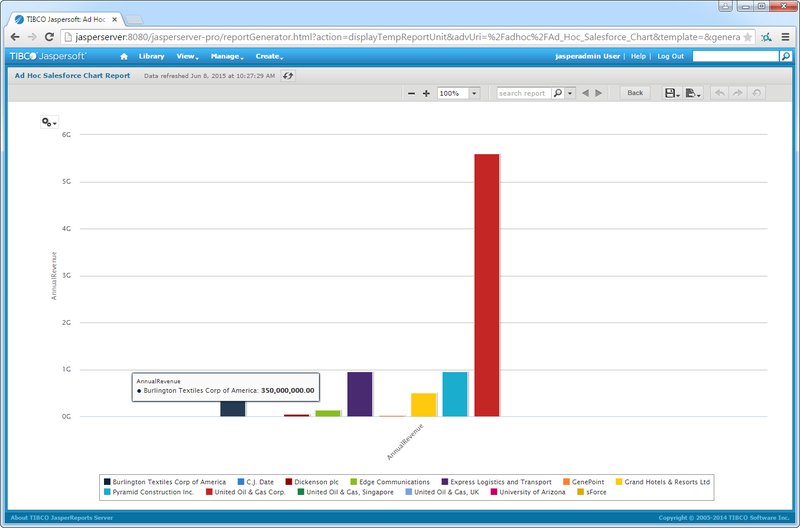 JasperSoft uses the metadata of the driver to detect the available dimensions and measures, based on the data type. Drag dimensions and measures onto the Columns and Rows boxes. Right-click a measure to change the summary calculation. Drag the Columns slider to the desired data level in the Filters section. To access updates to the data as you design the view, change the menu selection from Sample Data to Full Data in the design mode toolbar. 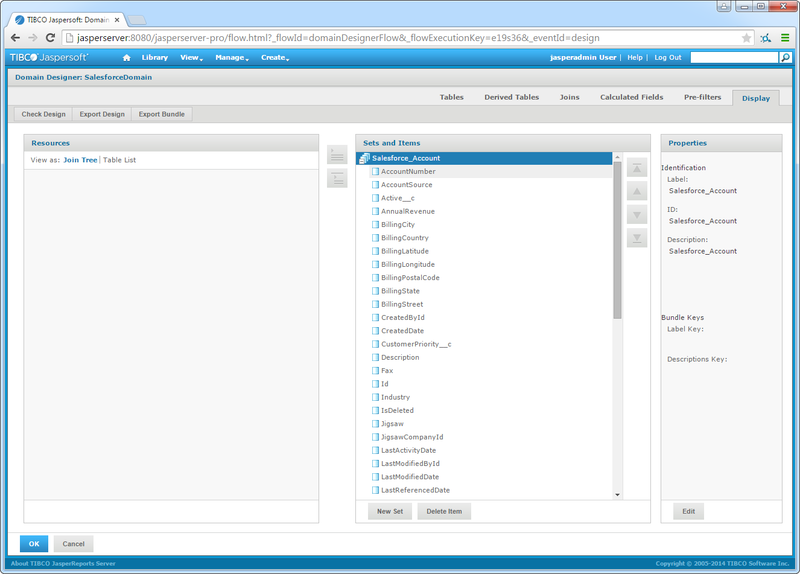 As you make changes, JasperSoft Server executes the underlying SQL queries to the driver. 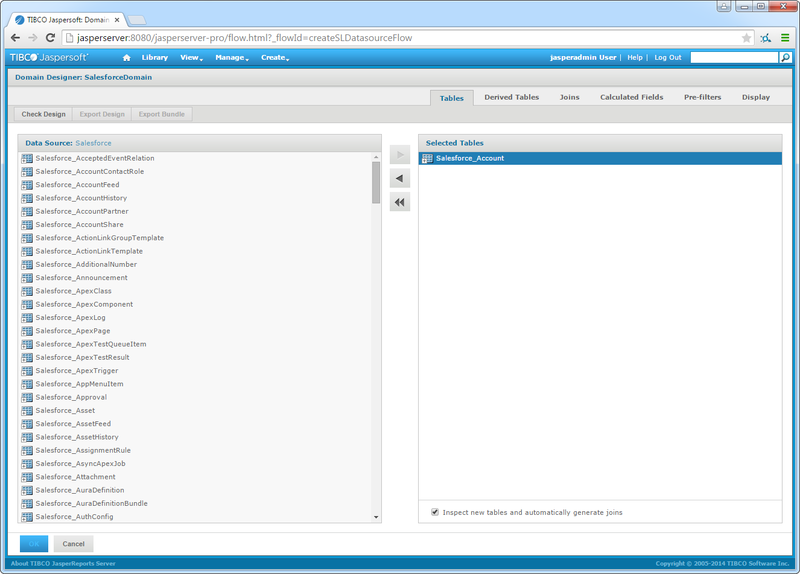 You can now create reports hosted on the JasperSoft Server. To do so from the Ad Hoc Editor, click Save Ad Hoc View and click Create Report.